From fishing boats to pontoons for your next Florida Keys vacation or weekend, Key Colony Beach Boat Rentals located in beautiful Key Colony Beach Florida offers affordable, well-maintained fishing boats and pontoon boat rentals delivered right to you. We can help make your Florida Keys vacation a delightful experience whether you come for the fishing or, countless other watersports, or simply to relax in the sun on the deck of a pontoon boat in the beautiful waters of the Florida Keys! We adhere to safe practice by educating our customers on proper boat safety, and our boating equipment meets or exceeds all applicable safety and environmental regulations. 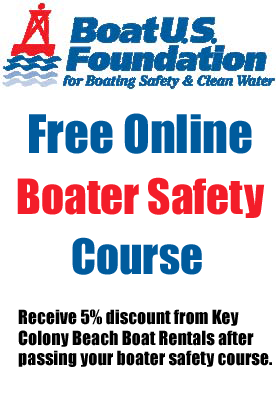 We also offer discounts to renters holding a valid captains license, and those that complete and pass a free boater safety education course online at BoatUS.org.